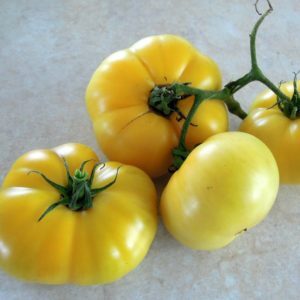 Dwarf Russian Swirl is a late-season rugose regular leaf dwarf with medium-large 6-12 oz oblate yellow-red bicolour fruits that have sweet well balanced flavours. 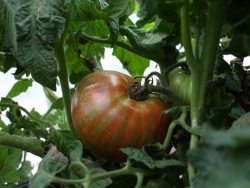 Plants reach about a metre+ or a little over 3 feet by end of season and require support due to the weight of tomatoes. Photo by Patrina. 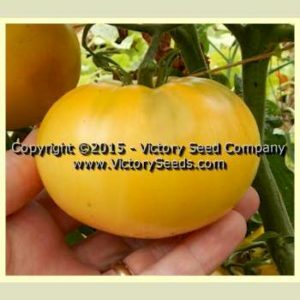 Dwarf Sweet Sue is a potato leaf dwarf variety that produces round to oblate medium sized fruit that ripen to bright yellow with a pink blossom end blush. 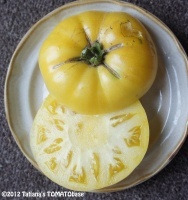 The flavor is outstanding – well balanced and sweet, and the variety is quite prolific. Photo by Victory Seeds. 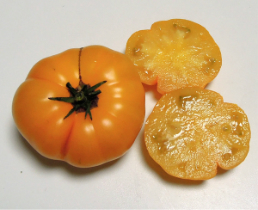 Lucky Swirl is a regular leaf dwarf variety that produces oblate medium large to large fruit that ripen to a rich yellow with swirls of red. The flavor is pleasant, mild and sweet. Photo by Marjorie Holloway. 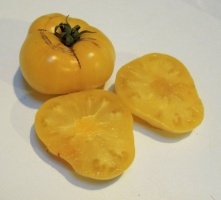 Summer Sweet Gold is a potato leaf dwarf variety that produces oblate medium to medium large fruit that ripen to bright yellow, some with a pale pink blossom end. Summer Sweet Gold is a reselection of Summertime Gold for traits closer to the original selection. Photo by Patrina. 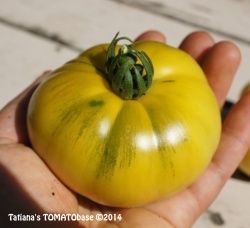 Summertime Gold is a potato leaf dwarf variety that produces oblate medium fruit that ripen to very pale yellow with a pink blush. 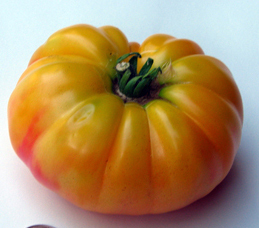 The flavor is well balanced and sweet, and the variety is quite prolific. Photo by Patrina.